Ski tours are enjoying increasing popularity – not just amongst mountaineering buffs and Alpinists, but also increasingly amongst young people. AlpenParks Hagan Lodge in Altaussee is an ideal place to stay for a holiday, and magnificent ski tours are a cert. Set your sights on a different summit every day and enjoy skiing through the powder snow which has no tracks – you can do this on a holiday in the AlpenParks Hagan Lodge Altaussee. What was in earlier times only reserved for the so-called ‘ski mountaineers’, is increasingly becoming a popular sport. The particular charm of the ever more popular sport of touring lies in the individuality of the tours. Skiing off the beaten track of a ski piste – that's what delights a ski tourer’s heart! That ski-tours are not just fun in the high Alpine areas can be seen in the increasing number of people who are going on tours along prepared pistes. 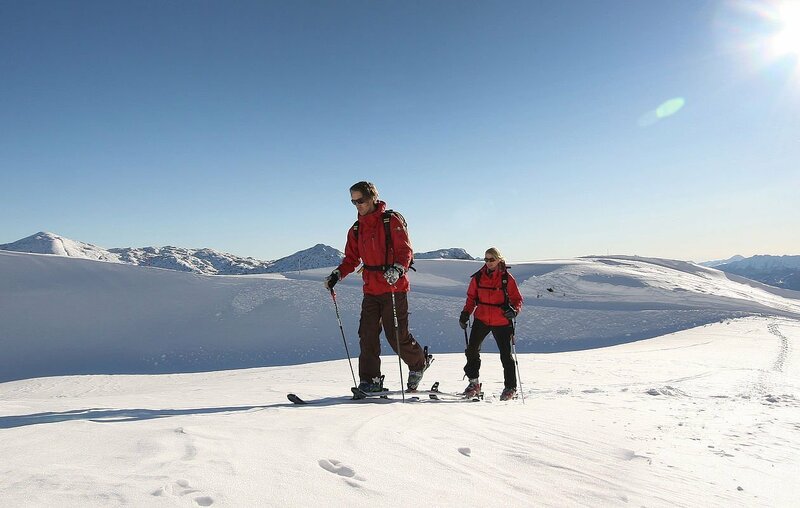 While a tour which is off the beaten track always has to be well planned, and is only possible when the weather conditions are appropriate, you can go on piste tours in almost any weather. On the proverbial doorstep of the AlpenParks Hagan Lodge Altaussee, all variants of this type of sport are catered for. Start your short tours, half-day and full-day tours right from your lodge. It’s only three hours to the summit of the Grießkogel, where you will never forget the fantastic view and the impressive beauty of the snowy winter landscape. Reserve your lodge today for your ski piste tours. The lodges in AlpenParks Hagan Lodge Altaussee are the perfect starting point for tours in the area. Start your non-binding booking enquiry now!